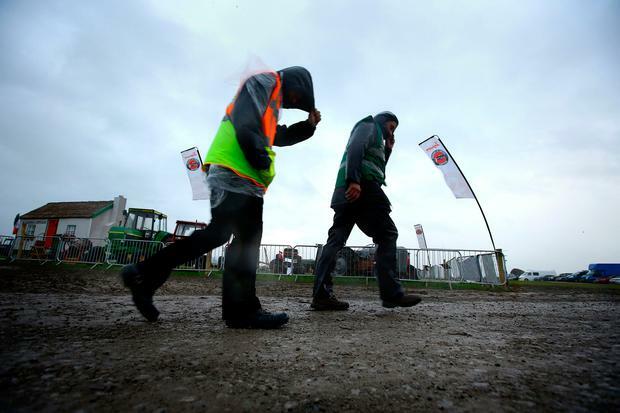 The National Ploughing Championship (NPC) will not open today following extreme weather conditions caused by Storm Ali. The decision was made at approximately 11.30am following constant reviews of the event's site this morning. "There wasn't a decision to be made then. "We couldn't have kept on prolonging it." 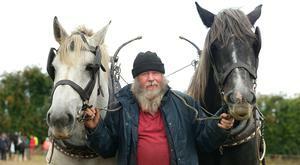 Farmer Edward Dudley spoke of his frustration at not being able to access the ploughing site this morning. "I'm frustrated and annoyed. I can't get in to feed and water my cattle since last night," he said. 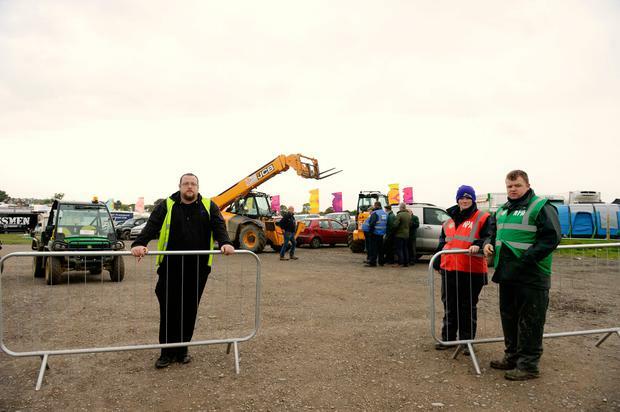 It was then confirmed shortly before noon that the second day of the National Ploughing Championships would not open at all. The Ploughing Championship was also previously called off in 2001 following the outbreak of the foot-and-mouth disease. It’s understood that the build and break crews have been allowed on site to assess the damage to marquees and tents. A number of marquees and tests collapsed this morning and straw is currently been taken on site for the cattle on site. Some exhibitors have spent hundreds of thousands of euro in marquee, insurance and personal costs. 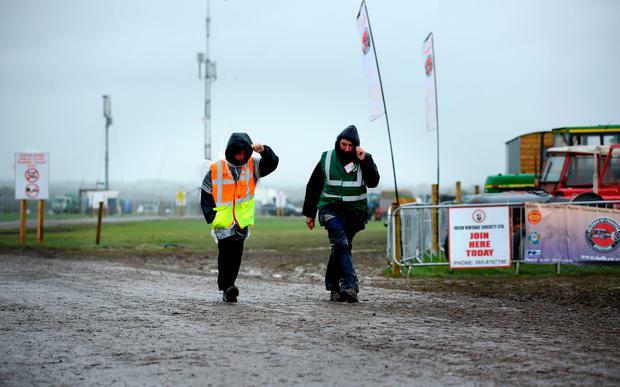 The NPA has said it hope to allow exhibitors on site this afternoon to assess damage to individual tents. 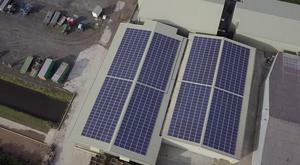 However, it’s still very windy on site and there is very restricted access to the site. "It's still not at a safe levels for exhibitors to go in and identify the damage done to the stands," Ms McHugh continued. "Hopefully this afternoon exhibitors can go in and see what damage is done. "It's not that we could have foreseen this last night. If you were awake in Tullamore this morning at 5am it was pretty calm. "The last reading from Met Éireann was positive. They take readings at 12 and at 6, every six hours. It takes two hours to put that into speak, so to speak, and their assessment was that it was fine. "When we received the information at 7.30am it looked like it would be fine. "The winds were more prolonged than expected and had more impact than expected." Ms McHugh said that there are over 1,700 exhibitors on the site. "The smallest stand is three metres by three metres, and with all their own hoarding etc it could cost between €1,000 and €1,500," she said. "There are some stands that would spend over €100,000." Ms McHugh also said at the moment they're investigating if the site could open for an extra day on Friday. "At the moment we're investigating every possibility." Speaking earlier on RTE Radio One, Ms McHugh said it is "not a quick decision". "And we are considering Friday," she said. "But it isn't a quick decision. It can't just happen. We will have to consult with emergency services and exhibitors. Met Éireann issued a Status Orange weather warning yesterday evening, saying; "Storm Ali will track close to the west and northwest coast this morning. The Status Orange warning applied to Connacht, Cavan, Monaghan, Donegal, Dublin, Kildare, Longford, Louth, Offaly, Westmeath, Meath, Clare and Kerry. The warning officially ended at 1pm today. In their latest forecast, Met Éireann said the storm is continuing to clear northeastwards. "There will be severe or possibly damaging gusts for a time especially in the west and northwest with extreme caution advised for a time in the coastal districts of Clare, Connacht and Donegal," they said. "Southwest to west winds with gales or severe gales will continue to abate this afternoon, but winds will remain strong in many areas. Some sunshine and blustery showers will follow this afternoon with highest temperatures of 14 to 17 Degrees." Meanwhile, IFA President Joe Healy said the NPA’s decision to cancel the second day of the Ploughing was a good call and that safety must come first. "Health and safety must come first. It was an incredibly difficult call to make with people travelling from all around the country," he said. "In fairness on the Wednesday last year people were saying the place was like a swamp and people were saying the following day that it shouldn’t go ahead but it was a very successful day, so that was probably fresh in the minds of the organisers. "People would have hoped that it might have eased off later today but it’s like anything, you never hear of matches being cancelled until a half an hour before. It’s a big decision to make with people employed over the three days on the stands and I fully accept how it wasn’t made last night."